With a Regranting scheme, we support people on the ground throughout Germany who oppose racism and are committed to the recognition of diversity. Germany is a diverse immigration country. At the same time, the rejection of diversity and racially discriminatory and marginalizing ideas are increasingly normalized and made more socially acceptable in public discourse. It must be countered everywhere directly and locally! With the action-fund ViRaL, we seek to support people who are committed to opposing these tendencies in their environment with courage and creativity, but who so far lacked the resources to do so. We promote anti-racist projects in urban and rural areas, in Western and Eastern Germany, and contribute to the development and dissemination of knowledge and strategies to strengthen the recognition of diversity. ViRaL combines both a financial grant of €5,000 and an accompanying year-long tailored program to empower the grantees to grow, professionalize and implement their project idea with impact. ViRaL started in March 2018 and ends in September 2019. For the first edition, we selected 10 projects out of 180 applications. 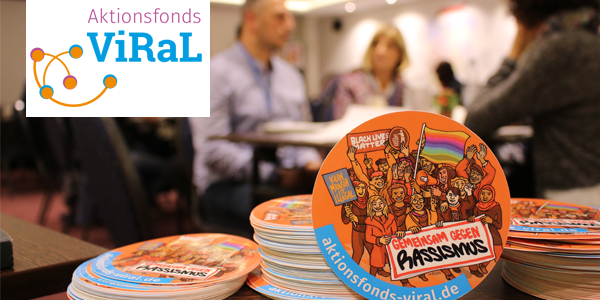 The ViRaL action fund focuses above all on cooperation with smaller civil society actors that have recognized the problem of racist exclusion and discrimination in their immediate surroundings and want to develop concrete solutions for overcoming them. ViRaL attaches a particular importance to the local anchoring of projects, that is, the conception of the problem of racism in its local context and its embedding in and cooperation with local structures. ViRaL seeks to reach out with anti-racist counter-narratives to people who have have not yet dealt with the topic, as well as to provide resources and support to those who are targeted by racism and exclusion. ViRaL combines both a financial grant of €5,000 and an accompanying year-long tailored program to empower the grantees to grow, professionalize and implement their project idea with impact. Within that program, ViRaL supports grantees by sharing our network and infrastructure and offering specifically tailored support and mentoring. Grantees can gain access to legal, technical and financial advice, anti-racist and diversity consulting or communication trainings. Along with local trainings for the grantees, the program invests in digital learning and knowledge dissemination formats (e.g., webinars, podcasts) to produce content that is accessible to anyone on the web. The ViRaL action fund is a re-granting and micro-granting instrument. 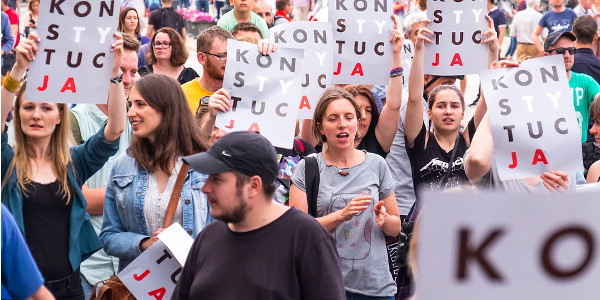 Citizens For Europe, with its broad network and reputation in civil society, acts as an intermediary between those who will receive funding and large donors. With its structure, it also enables the promotion of informal groups. In addition, Citizens For Europe mobilizes its expertise and network as a civil society player to help monitor the content and strategy of the projects. In contrast to subsidies with a broad target group, the ViRaL action fund makes it easier for us to check the impact of the funded projects and the fund itself. The funded projects have clearly defined target groups from their immediate environment and are usually anchored themselves in the communities to be reached. "We focus on tangible change at the local level. Successful local alliances or projects show that positive change can be achieved. In the medium term, a similar dynamic can be established on a national or European level.” says Lucile Gemähling, project coordinator for the action-fund. The documentation of the projects’ progress plays a central role in our funded projects. We promote the projects using video, images and texts on social media. Thus, the parties involved increase their visibility and multiply the enlightenment effect of their work. With a re-granting scheme, we support people on the ground throughout Germany who oppose racism and are committed to the recognition of diversity. ViRaL seeks to reach out with anti-racist counter-narratives to people who have have not yet dealt with the topic, as well as to provide resources and support to those who are targeted by racism and exclusion. We provide the selected projects with mini-grants, tailored trainings and the tools they need, and we share our network and infrastructure with them. For the defense of freedom, democracy and fundamental rights! We build an international network of activists and watchdogs united by the idea that we can only exist in international solidarity in order to counter the internationally networked opponents of the new Right. Our partnership currently supports, empowers and networks activists who stand against the erosion of democracy, the rise of nationalism and white supremacy, as well as the shrinking of civic spaces where civil society is under pressure. 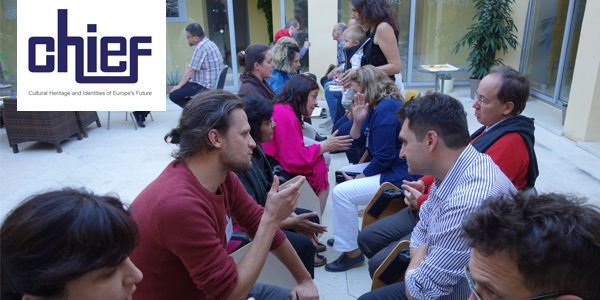 The European CHIEF project builds a dialogue between young people, researchers, education practitioners, policymakers, community leaders and civil society activists in order to facilitate a future of Europe based on more inclusive notions of cultural heritage and cultural identity. Citizens For Europe will methodically design a multi-stakeholders' process and accompany a series of workshops to create a sustainable environment for dialogue between these actors and develop effective policy recommendations at the local and European level. We demand the right to vote for all people living here! In Berlin more than 700,000 residents are excluded from voting in elections for local, regional and national representatives and referendums, simply because the Berlin electoral law is tied to German citizenship. 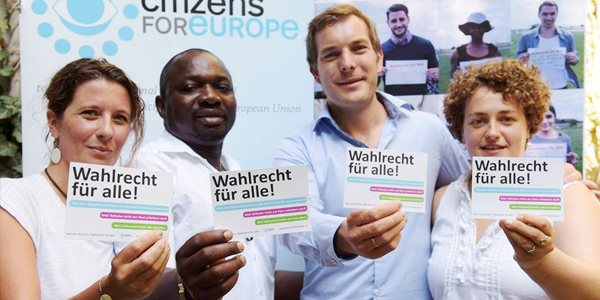 Since 2011, the Berlin alliance “Wahlrecht für Alle” (“Voting Right for All”) has drawn attention to this injustice and has been committed to enabling the political participation of all people living in Berlin, regardless of their nationality. We therefore call for national voting right for EU citizens and third-country nationals, as well as for local and municipal voting right for third-country nationals. Started in December 2015, the two-year NiCeR project used theater and the power of storytelling to develop a counter-narrative that strengthened youth participation in local cultural and social life while promoting skills development, empowerment and living together in cultural diversity. 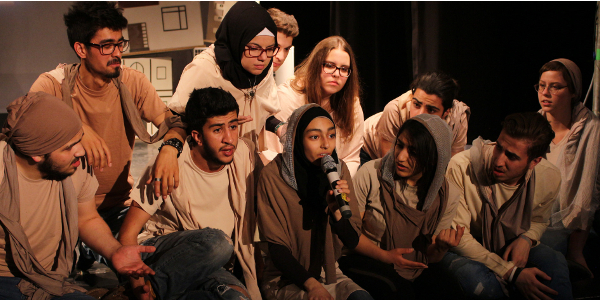 In Berlin, 30 young people from Berlin, Kosovo, Syria and Afghanistan came together, created and performed the musical What the Volk?! based on identity, belonging, migration and the power of language. Our youth film project brought together 9 young who grew up in the rural areas in Spain, Greece and Germany. They grabbed a camera and told their own stories beyond the media spin and stereotypes that have dominated the mainstream narrative in the European Union over the last few years. 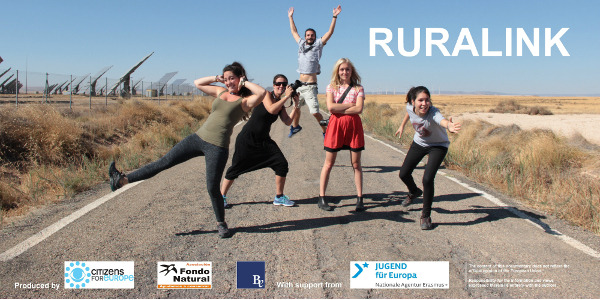 After taking part in a film training, they travelled in September and October 2016 as transnational groups through the rural areas of Brandenburg (Germany), Lesbos (Greece) and Aragón (Spain), where they interviewed other youngsters about their lives in the rural areas, their dreams and everyday challenges.